A lot of inclement weather, cloudy and rainy. Not much of interest has occurred. I was assigned to Lt. Davis’ crew along with Beaumont, Meador, Russell. Were supposed to fly Sunday a.m. [April 30] but didn’t. Then I checked the life rack equipment on 108 instead. Received 12 letters these past few days and have been using my stationary as a racetrack. Seems funny writing with a horse at last, am all caught up. My goodness, Bonnie is surely the most faithful the finest and best wife in the whole world. Her letters are a ray of sunshine on a dark day and a blessed cool cloud on a bright one. She has every ounce of love and adoration I’m capable of giving and will always have it, no matter what happens. Wednesday passed quickly. Not much happened. Received several letters and wrote all day to catch up. Wrote Bonnie, Tom, Guy, Mom, Nordy last night and Dad today. We had our picture taken today by crews. We’ve a new pilot, flight officer Long, whom I knew and rode with at Columbia. Nice fellow and a pilot’s pilot! He’s on his third trip up here now! Am very lucky to get him. I’ve felt wonderful the past couple of days. Maybe it’s because I’m happy who knows. I’ve an armament lecture at 1:00 p.m. so I’ll close for the time being. Adios, My Love. Very disgusted this afternoon. No water for showers and we all felt pretty sticky. The armament lecture was on solenoid, timing and headspace. Old stuff. Went to the show and saw Yokel Boy5 a few laughs but better than sitting on the sack and thinking. Still no water after the show, “Nuts”. Read the Bible for half an hour and retired. Surely miss my wife. Briefed tonight. 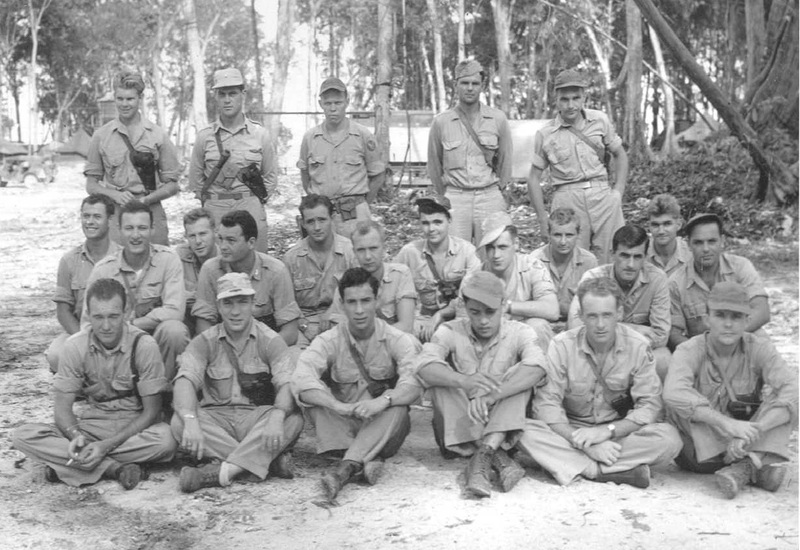 1 Missions such as this appear in communiques from General MacArthur’s Headquarters. This mission, reported as “Our medium units from Solomons bombed enemy shore batteries at Borpop,” was reported in typical laconic form and revealed few details. “G.H.Q. Communique,” Kalgoorlie Miner, Western Australia, 05 May 1944, p 4, col. 4; digital image, Trove, National Library of Australia (http://nla.gov.au/nla.news-article95760560 : accessed 29 April 2014). May marked a slowing up of bombing activity. Although the Group averaged more than one mission per day for the month, the missions were more or less routine runs which were not intercepted, and the AA had actually begun to diminish. Our efforts of preceding months were bearing their fruit. Rabaul Town had been reduced to rubble and our job was to keep the five satellite airfields unserviceable and to destroy the supplies that the Nips had dispersed from the Town storehouses when the rain of bombs came. How well we succeeded in keeping Lakunai, Vunakanau, Tobera, Rapopo, and Keravat out of commission and unfit for staging was proved by analysis of reconnaissance photos. Only three aircraft could be found by the photo interpreters and for the first month on Stirling, no “Condition Red” was sounded during May. In addition to the primary Rabaul job, May also saw Crusader Mitchells dropping bombs on Borpop, New Ireland, and Buka Passage from medium altitude. United States Army Air Forces, The Crusaders: a history of the 42nd Bombardment Group (M). (Baton Rouge, La. : Army & Navy Pictorial Publishers, 1946). World War Regimental Histories. Book 113. p 88: digital image (http://digicom.bpl.lib.me.us/ww_reg_his/113 : PDF download 17 April 2014). As an armorer/gunner, Wayne was responsible for the maintenance and operation of the B-25’s .50 caliber machine guns and, on some models, the B-25s 75 mm cannon. B-25H models carried 14 .50 caliber machine guns; the B-25J models carried 18. These machine guns made the aircraft an effective strafing weapon, but required a great deal of maintenance work by the armorer /gunner to keep all the machine guns functioning properly. 4 Robert Montgomery and Carol Lombard appeared together in Mr. & Mrs. Smith, a comedy about a couple who discover their marriage is invalid. Produced by RKO Radio Pictures, it was released in January 1941. The director was Alfred Hitchcock, and this is reported to be the only comedy he ever directed. This is the first American film to feature a pizzeria. See http://www.imdb.com/title/tt0033922/?ref_=nm_flmg_act_14. 5 Yokel Boy was produced by Republic Pictures and released in 1942. A romantic comedy, it starred Albert Dekker, Joan Davis and Eddie Foy, Jr. See http://www.imdb.com/title/tt0035581/?ref_=fn_al_tt_1. This entry was posted in Uncategorized and tagged Beaumont, Bible, Borpop, clothing, crew photograph, Davis, diet, Harry Nordman Gray, laundry, Long, Meader, Robert Earl Russell, sunglasses, tail turret, water. Bookmark the permalink.